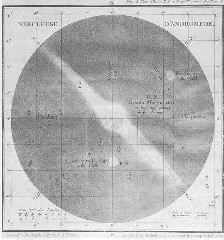 Messier's drawings of the Andromeda Galaxy M31 (Andromeda Nebula at his time) with its companions M32 and M110, and of the Orion Nebula M42 with M43. Click on the images to get larger versions. 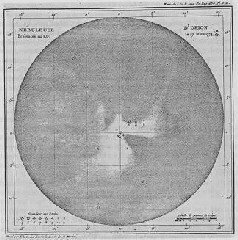 Messier's M31 image has some descriptions of the 3 "nebulae" shown, including the discoverers, and thus documenting Messier's 1773 discovery of M110. In the M42 image, M43 can just be seen as small nebula around the star below and right of M42. The Andromeda Nebula M31 drawing was published in 1807 in the Recueil de l'Institute, Vol. 8, p. 213. 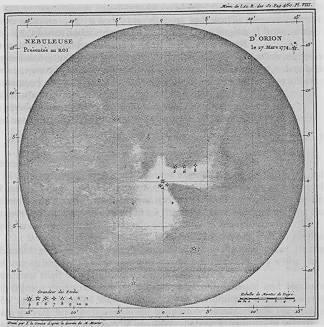 The Orion Nebula M42 drawing was published in an addition to the first version of the Messier Catalog in the Mémoires de l'Académie Royale for 1771, between pp. 460 and 461.